After the death of his business partner Mr. Carden in 1935, Captain Vivian Loyd left Vickers Armstrong with a view to forming his own company. His goal was to produce vehicles for use in transporting men and equipment across the battlefield, and so the Vivian Loyd & Co. was born. In 1939 the company produced the first prototype vehicle call the Loyd Tractor. So successful was the prototype vehicle that the War Office immediately ordered 200 with modifications to the body work and re-designated it Loyd GS (for “General Service”) Carrier. This first production batch had the T numbers 10474-10673. The Loyd Carrier was developed into many variants besides a General Service Carrier for troops and equipment, including being used to tow the 6 pdr. anti-tank gun, and 4,2 inch mortar and team. There was also a Loyd Mk I and Mk II cable layer, Up-Armoured prototype, An Anti-Aircraft version, Mobile Welding Plant variant, and Self-Propelled Anti-Tank version. Many of these got no further than the prototype stage. Whilst the Bren Carrier was developed with the Bren Gun team in mind, the aim of the Loyd carrier was always the movement of men and equipment around the battlefield, and in this it had a distinct advantage, being open-ended at the rear. This made the loading/unloading of troops and equipment much easier. Of all the Loyd roles, the one that was unique to it was the Loyd Carrier Tracked Starting and Charging. These were issued to armoured units to enable to start their tanks and charge their batteries. In 1941, 370 Loyd TS & Cs were produced. They were special purpose builds, and housed 30 volt and 12 volt dynamos, which were driven by a power-drive sited near the gear box. The remainder of the vehicle was crammed with spare batteries, control boards, jump leads, etc., along with the necessary tools for the job, with the crew fitted into whatever cramped space that was left! 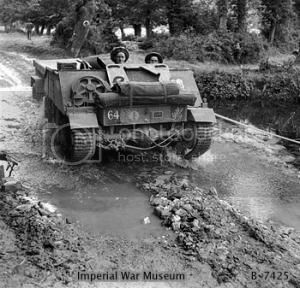 There were 4 versions of the Loyd Carrier Tracked Starting and Charging: No.1 Mk I, No.2 Mk I, No. 2A Mk I and No. 3 Mk I, with the main difference being the type of engine and the stowage of the tools. The later versions had the tools stowed on the upper front hull, while the still later versions had a two-piece armoured front. The kit from Accurate Armour is a No.1 Mk 2A or No.1 Mk 3, but I can’t be sure which and am still looking for clarification. 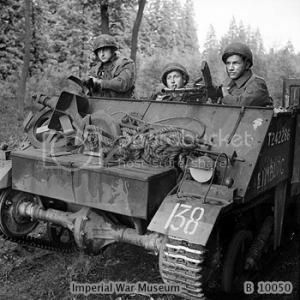 Unlike its more well-known counterpart, the Universal Carrier, the Loyd was steered by the use of breaking levers (tillers), and the driver sat centrally in the front of the vehicle. It also came with a canopy supplied as standard. Due to its larger carrying capacity, and being lightly armoured, it tended to be used more in a support role. So enough of the potted history-- what’s in the box? The kit comes packed in the standard Accurate Armour sturdy cardboard box with a lift-off lid. On top is a picture of a completed Loyd Carrier, along with a product description. On the side is a nice “Made in Scotland” logo. Inside you get three large plastic zip bags of resin parts, a decal sheet, and a small PE fret, along with a 12-page A5-size colour booklet of instructions and build pictures. There are 94 different parts listed, some of which have 1-10 separate items, so it would not be appropriate to try and discuss every single part of the kit. I will give you a feel for the contents of each bag and comment on the quality of the casting and detail of some of the parts. The parts themselves are cast in a light grey resin, and are highly-detailed and appear free form any damage or air bubbles. This contains the axels, drive wheels, suspension units, road wheels main engine and drive shaft, plus several battery boxes and the charge control board cable tray, dynamo wing nuts and idler axel. The detail on the engine and parts in general is excellent, and exactly what we have come to expect from Accurate Armour. This contains the track sections, 12 volt batteries, return rollers, vice large stowage roll, medium stowage roll, inner belt, outer belt, engine fax, distributor, left and right exhausts, 6 volt batteries, distilled water jar, rear mudguards and headlamp, gas pedal, front mudguards, towing hook and jack, spring units, rear axel, tools and a range of other smaller parts to help complete the build. This contains the chassis, side plates, bulkhead, front plate, main battery table, slave battery bank, stowage tray, stowage bin, front seat, stowage rack, dynamo cover, left and right fuel tanks, engine side covers, radiator, front stowage box, and fire extinguishers. You will need a sharp razor saw to remove the pour plugs and a sharp hobby knife blade and some files to tidy them up. Page 1 of the instructions again outlines the details of the kit and company contact information. It contains 2 colour pictures of a completed carrier so you know what you’re aiming for. Page 2 is given over to general build instructions covering safety, tools and the general procedure for working with resin. Page 3 outlines the build of the lower hull and tracks, page 4 the build of the basic interior and engine and on page 5 you get build instructions on both external and internal fittings. Page 6 covers the adding of the charging set (batteries to you and me) and page 7 the build instructions to fit the battery table plus a picture of the completed build. The colour pictures are all marked with arrows pointing to part numbers corresponding to the sprues so provided you take your time and test fit everything first these should be sufficient to allow a successful build. On page 8 you get instructions on how to add the Roof Framework if you choose to do so, as this was a common feature on the Loyd, but is not provided with the kit. Page 9 gives you a guide to the decals proved along with information about WD numbers specific to they carrier type. Page 10 carries a painting guide and importantly the start of the General Build Instructions which are continued onto page 11, so make sure you read through the instructions thoroughly before starting the build. Finally page 12 gives you a listing of all the parts and what they are so you can check the contents of the box and broaden you knowledge and understanding of the vehicle. You get a good range of decals covering a variety of units with appropriate WD numbers, air recognition stars and bridge classification signs, all giving a fairly wide range of possible unit finishes, plus 2 rows of independent numbers to add choice to the unit chosen. The sum is pretty much all you should need really. You get a small fret of PE for the engine and these parts are indentified in the build instructions. Also included is a short length of plastic rod you will need for the build. This is a highly-detailed and well-cast kit that should build up into an excellent representation of the Loyd Carrier Tracked Starting and Charging. There is only a little flash on the chassis hull, plus of course the pours parts themselves. Overall it will make a 1st class stand-alone vehicle of this workhorse of the British and Commonwealth forces, and has many diorama possibilities. You get a full compliment of stowage, but in these wee vehicles, there is always room for more! It is a pity appropriate brass rod for the vehicle cover was not provided, but the addition of the roof framework guide on page 8 of the instructions is very helpful. Overall this looks to be a really cracking kit, of a very common WW2 allied vehicle that until recently had been pretty much ignored, so kudos to Accurate Armour for both this kit and the 3 other variants of the Loyd Carrier they offer. Universal Carriers, Volume I by Niger Watson. Highs: Excellently cast and highly detailed. This is a cracking kit from Accurate Armour. Lows: The lack of build material for the roof framework is a pity. Thanks, Alan, you really are an important addition to the site with all the Allied resin reviews you submit! Cheers! A bit late, but thanks for the review Alan. I'm just about to tackle this Accurate Armour kit myself.